It was the 30th of August (08.30.2017) and I will be honest, it was disappointing. Okay, whenever we have five weeks within a month we end up getting less amazing comics within that last week so, I should’ve expected less, but still…. Thankfully there were 5 comics that were worth your time. Sadly, no honorable mentions this week. Keep in mind I just started the amazing Saga by Brain K. Vaughn, don’t expect issue #46 to be on this list, but there are some other comics worth talking about. This one opens with a shocker! It makes me very confused, but then I read on and think to myself, “Oh, okay I see what this is.” Thanos continues being one of the best titles Marvel has currently on shelves since it’s written by Jeff Lemire. I suggest you read all 9 previous parts because having this be your jumping on point is really going to ruin the overall pay off. Usually this series would be at a higher spot. I don’t wanna call this the worst issue of the series, but the least best one. The challenge Thanos is supposed to face turns out to be disappointing to say the least. Maybe Lemire intended for this, maybe he will reference this later on and do a twist with it, but when? This writer is leaving the run in just 1 issue and then a successor is taking his place. The issue within itself was great and moved the building blocks for the big conclusion, but it could have been more interesting with the challenge posing a greater threat. Issue #276 of Spawn was my jumping-on point to the character as it was the part 1 to the current story arc, Dark Horror and I recommend you do the same if you wanna be more familiar with the character before his movie comes out. Dark Horror is the best place to start, not only because it doesn’t require you to know the history of the character, but the art by Jason Shawn Alexander is fantastic. The story and art truly live up to the horror element. Alexander’s pencils are stunningly beautiful and deserve all the praise that it will get. I am very happy that this is where I decided to join the Spawn fanbase. Overall a beautiful horror spectacle. The last issue of the limited series brings a conclusion to the adventure of Shadowman, Ninjak, Geomancer and Punk Mumbo. You have no idea who these characters are? That’s because they are from the 3rd superhero comic publisher, Valiant Comics. Jack Boniface really shines in this issue, the stage was his. The series started decently and ended with a bang. It felt like I was reading an epic season finale to a series which means you should require to know who these characters are and understand certain concepts. If you’re a newcomer this isn’t a comic for you. I recommend first reading X-O Manowar Volume 2, Shadowman Volume 1, Ninjak Volume 1 and The Valiant. Valiant Comics charges only $10 per trade paperback so this would bring you to about $40. A pretty good deal if you ask me. Start reading Valiant, then come back to this. You just wanna read something random, self-contained and fun? Bingo! Lobdell has stunned the world with how good this series actually is, compared to his other work. This run has heart, soul and action. Red & the Outlaws is quickly becoming my favorite comic of the year! While the run itself deals with much more important matters to the team, this one takes time to be what any annual issue should do, be a fun contained story. What if I told you this one also has Nightwing guest-starring? And it creates an aspect of the relationship we have never seen between the two former. Ever. Add Artemis and Bizarro to the mix and you have yourself a very entertaining comic with hilarious bits. This was the most fun I had this week until…. The biggest surprise of the MONTH! Marvel Generations has progressively been becoming better and better every issue (except for Generations: Thor) so why was I surprised? I didn’t like the first issues of Kelly Thompson’s Hawkeye (starring Kate Bishop) run at all, knowing this was also written by her made me feel dragged into the thing. To my surprise the moment I started reading the more I was pulled in. I didn’t know Kelly Thompson has this sort of talent. I spoke with my friend afterward, I told him the exact same thing I’m telling you and he showed me images of the her solo series past issue #2 with some flying creatures and tight action scenes. I said, “Haha! That looks awesome.” So I might have to give Kelly Thompson’s Hawkeye a new go. Funny story, I hated Hawkeye by Matt Fraction, a year or 2 later I gave it another shot and it became one of my favorite comics of all time. But let’s talk about this issue itself. 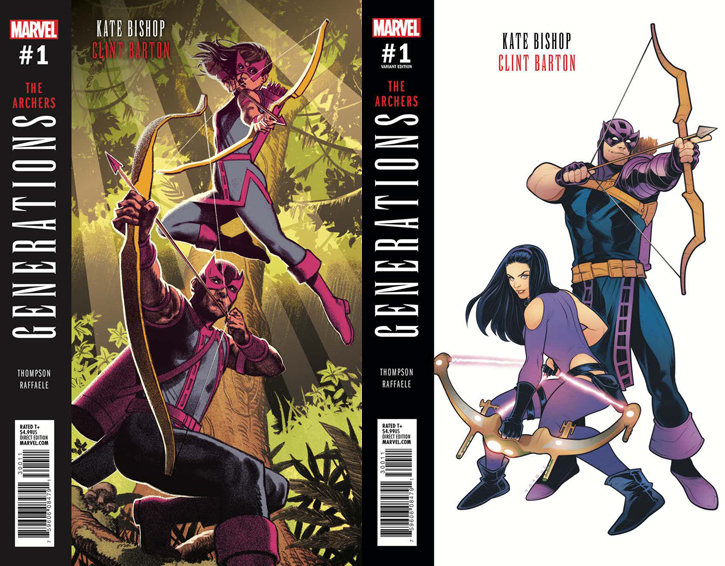 Kate Bishop suddenly finds herself stuck on an island, and suddenly runs into Clint in his younger age. They fight against other marksmen to survive. I was smiling throughout the entire thing! Then I started laughing. The action was very well done. Kelly Thompson, you impressed me more than I have ever imagined. I found that Marvel has lately, subconsciously been very neglectful of their past stories/characters, but this issue alone has reference after reference to things that make being a Marvel long-time reader rewarding. Clint Barton is written perfectly and 100% in character. The interaction between Clint and Kate is dynamically brilliant, turning to the last page made me sad to know it was ending until I saw a promo of Clint coming back into Kate’s solo series in December on issue #13! This is going to be my coming back point for Thompson’s run. Thank you Kelly Thompson! If you’re reading this make sure to give Marvel a boost in stories that matter to the fans like you did here. Thank you. So as you can see the week was still pretty good for a week 5, but nothing compared to your regular weeks. With this being said let me know in the comments if I should start mentioning spoilers that way we can all geek as much as possible. Or should I only spoil the DC & Marvel titles? Or should I spoil the popular ones only? Tell me in the comments! I wanna make sure this series is something you guys wanna read. Until next week. Previous #DebateWatch Peter vs. Miles – Who is the better Spider-Man?